This Sunday, we hear about Peter and the Apostles following Jesus, believing in Jesus and preaching about Him (Luke 5:1-11 and 1 Corinthians 15:1-11). For them to do this, they had to be in communion with Jesus, open to His transforming grace. And this meant that they prayed, every day. The same is true for you and me – we need to pray, for prayer is communion with God. Prayer is a gift from God the Holy Spirit (Romans 8) – prayer enables us to be disciples of Jesus Christ, to witness to His love and mercy. Prayer is a surge of the heart, a simple look turned toward Heaven, a cry of recognition and of love, embracing both trial and joy; prayer is the raising of one’s mind and heart to God, asking good things from God (Catechism of the Catholic Church, #2558-2559). 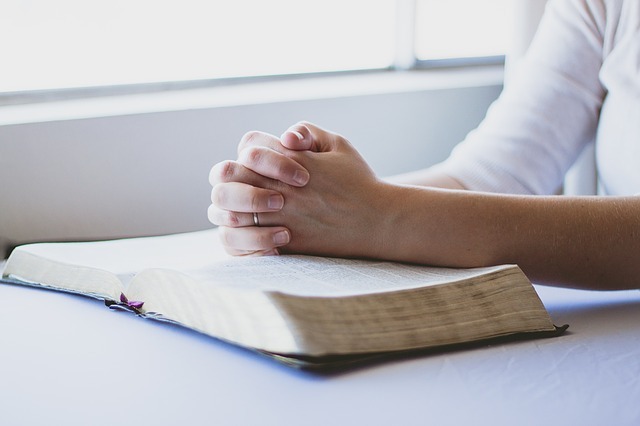 Daily prayer is essential in the life of every Christian – as essential for our soul as food and water is for the body. Prayer changes us, draws us away from sin and into holiness, conforms us more closely to Christ. Jesus taught us how to pray (the “Our Father,” Matthew 6, Luke 11). He showed us the centrality of prayer in His constant communion of prayer with God the Father and God the Holy Spirit ( John 17). God the Son became man, taking on our human nature yet remaining divine, to enable our fallen human race to find its way back to Him, to God the Father, Son and Holy Spirit, to redeem us by His Passion, Death and Resurrection and Ascension into Heaven. In the New Testament, we read of Jesus reserving time to focus on His communion with the Father and the Holy Spirit (Matthew 14:23, Mark 1:35, Luke 9:18), as Jesus is always with Father and the Holy Spirit in the mystery of the Holy Trinity. He prayed on the eve of His crucifixion, in the Garden of Gethsemane, where He even sweat blood praying for us. Saint Clement and all the saints, inviting others to pray and to proclaim Jesus Christ, the Only Savior of the world.